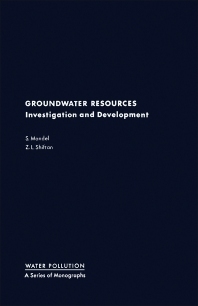 Groundwater Resources: Investigation and Development is a 13-chapter text that presents in a logical structure the various useful techniques for groundwater investigations. The introductory chapters deal with the general concepts of hydrology, types of aquifers and groundwater environments, and geographic and geologic topographic maps. These topics are followed by considerable chapters on groundwater investigation techniques, including geophysical and geochemical methods, drilling and isotope techniques, exploration, and pumping tests. The advantages and limitations of these techniques are examined. The discussion then shifts to interpretation and utilization of water level measurements and spring flow. The concluding chapters are devoted to determining the three boundaries enclosing the groundwater systems, namely, the fixed, movable, and arbitrary boundaries. These chapters also look into the principles of groundwater balances and groundwater reserves.